On the 10th October 2018 the RESERVE partners participated to the Exploitation Strategy Seminar (ESS), one of the six on-demand Support Services for Exploitation of Research Results (SSERR)* offered by the Directorate-General (DG) for Research and Innovation of the European Commission to the partners of an Energy research project that are interested in maximising the value added and impact of their projects. In particular, the objective of the ESS is to brainstorm and discuss on how the projects address exploitation opportunities, risks and potential obstacles, enhance the team awareness on the importance of connecting with customers and better communicating project results. The agenda and the content of the seminar were agreed before the workshop by the project coordinator together with a consultant that was assigned by the Commission to the project in order to act as facilitator for the partners. The exploitation plan of RESERVE can be summarised in the following figure, which highlights the 10 Key Exploitable Results (KER) that have been firstly identified as the main project outcomes. After an introduction made by the Commission consultant about the concept of exploitation, the ESS general objectives and the European Commission expectations, the partners gather, according to their competences and duties within the project, in three groups corresponding to the KERs mentioned above. The group members discussed actively about the specific project results, and had the opportunity to clarify issues, analyse risks and problems connected with the exploitation, suggest solutions and actions, and set-up a targeted exploitation plan. The results of the groups discussions were finally presented to the whole audience and opened to debate. The outcomes of the seminar will be collected and used by the expert for drafting a final report. At the same time, the useful exercise done during the ESS seminar gave the project partners the chance to look at this topic under a new perspective, fostering new ideas on how to promote the project result in order to maximise their impact. The EU Sustainable Energy Week (EUSEW) is the biggest event dedicated to renewables and efficient energy use in Europe and it is organized annually by the European Commission’s Directorate-General for Energy and the Executive Agency for Small and Medium-sized Enterprises (EASME). EUSEW debates energy policy, creates networking opportunities and spreads the word about the latest developments on the sustainable energy market and in research, and it is attended by a varied audience composed of policy makers, authorities, industry, stakeholders, NGOs, researchers and academia in the European sustainable energy sector. The 2018 edition of the EUSEW focused on the topic: “Lead the clean energy transition”. Beside the high-level policy conference, that took place on the 5-7 June, and that consisted of over 60 sessions attended by 2500 participants, other side events were held as usual during the energy week. These were the Award Ceremony, aimed at recognising outstanding innovations in energy efficiency and renewables, and the Networking Village activities, which included interactive exhibition stands at the Energy Fair, a variety of Energy Talks engaging presentations on topics related to the clean energy transition, and the Energy Lab, where 10 selected projects had the possibility to pitch in front of an expert panel of judges. 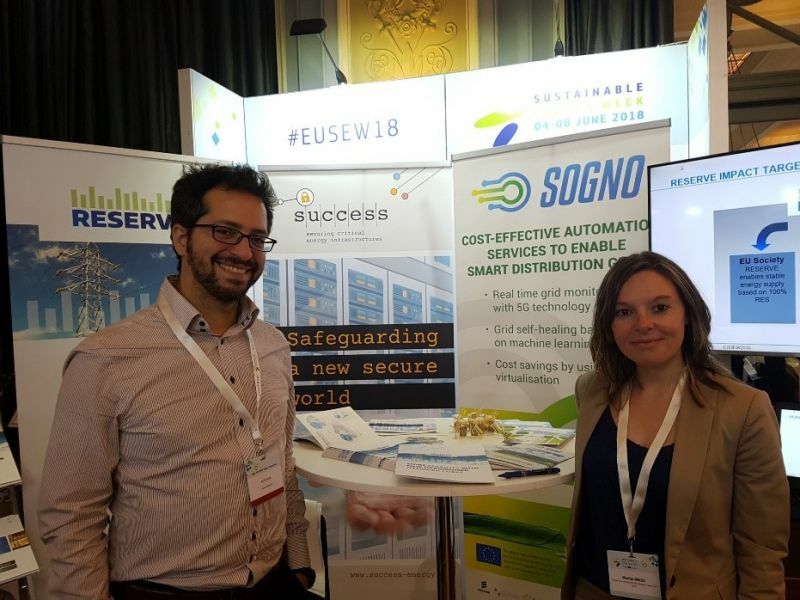 RESERVE participated to this year edition of the EUSEW with a stand at the Energy Fair of the Networking Village, jointly with the H2020 Projects SUCCESS and SOGNO. The title of the joint stand was: “Stability, Security and Automation Towards 100% Renewables”. Stability and security, in particular cyber-security, has grown in importance for energy providers in recent years. Long outages caused by grid instability or attacks on power networks can cause great disruption to economic activity and even jeopardize the lives of citizens. Additionally, in our current energy networks stability is so far typically provided by fossil fuel turbines which will need to be compensated for to reach the goal of 100% renewable energy penetration. These major challenges for the future DSOs are addressed by the projects SUCCESS, RESERVE and SOGNO and were the thematic pillars of the stand. The RESERVE project develops novel research concepts for voltage and frequency control and new techniques and solutions based on the 5G mobile technology. They will be implemented through an innovative pan-European real-time simulation infrastructure and validated in a field trial. The SUCCESS project develops an overarching approach to threat and countermeasure analysis with special focus on the vulnerabilities introduced by smart meters. A new joint design of energy infrastructure and ICT is proposed, which can also apply to all critical infrastructures. The SOGNO project will provide turnkey services simplifying the life of the distribution grid operator by maturing the services implementing next generation data-driven monitoring and control systems, based on 5 G based ICT. During the exhibition the EUSEW participants had the opportunity to come to our stand and learn more about the topics of our projects, ask interesting questions and take home the project brochures and promotional materials made available. Once more, the EUSEW allowed us to showcase successfully our project and to increase our network of contacts. 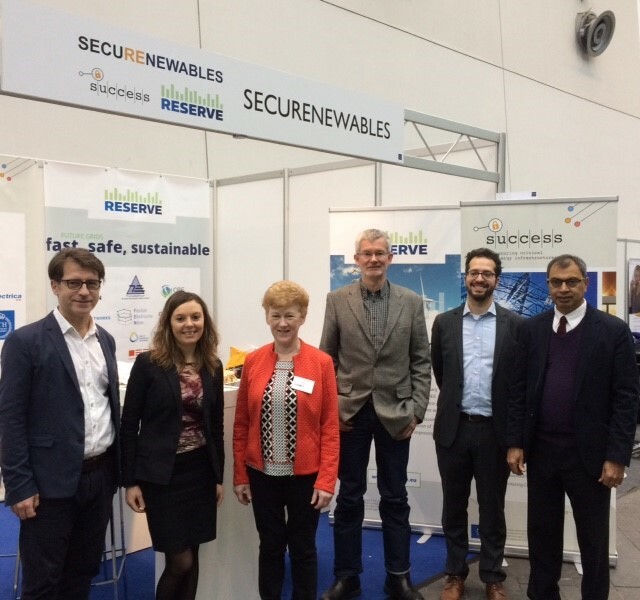 RESERVE - together with the H2020 project SUCCESS – attended the E-world energy & water trade fair that took place in from February 6th to 88th, 2018, in Essen, Germany. According to the organisers, 750 exhibitors from 26 nations (which was more than ever before) presented their solutions for the future of the energy supply at Messe Essen during the 2018 edition. Digitalisation, flexibilisation and decentralisation were the defining subjects on which the over 25,000 visitors from 73 nations obtained information and exchanged ideas. 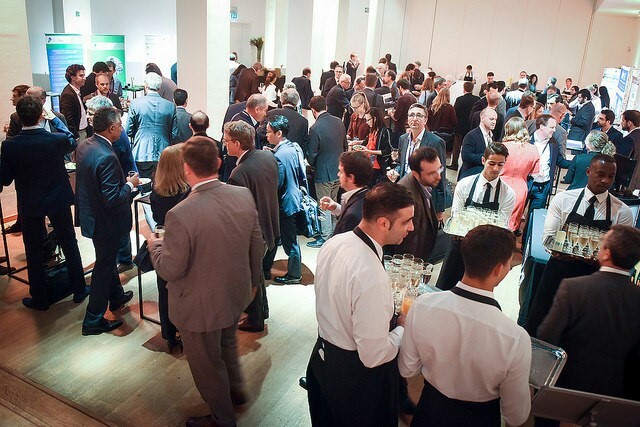 With 76%, the majority of the guests at E-world were commercial representatives interested in making business with energy providers, consulting firms and companies selling support services such as SW, sensors or other devices. Moreover, in a dedicated hall of the fair, over 90 start-ups, i.e. newly established companies and research institutes, introduced products that consumers can expect in the future. 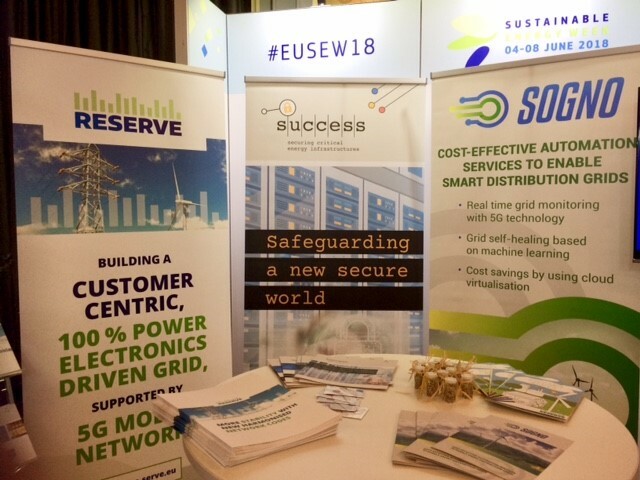 Our project RESERVE shared with SUCCESS a joint exhibition stand named “SecuRenewables” which merged the main topics of the two projects: cyber security (SUCCESS) and 100% renewable energy sources (RESERVE). For RESERVE, the partners Ericsson and FEN participated in the three-day event. 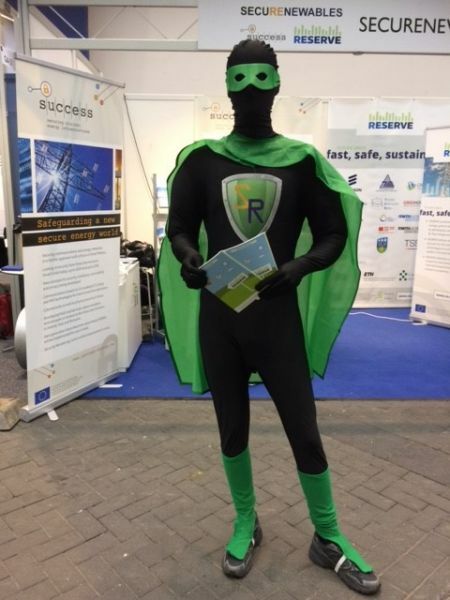 They were supported by the presence of a “renewables hero” mascot who had the task to attract the attention and increase the interest of the fair visitors, bringing them to the stand where the projects’ representatives could then explain the content and the objectives of the projects to them. Other than welcoming the visitors and presenting RESERVE at the SecuRenewable booth, the project members visited the stands of other companies present at the exhibition in order to find interesting potential contacts for our present and future work. Some stimulating conversations were started and we succeeded in raising awareness of the security and frequency/voltage stability subjects. We also succeeded in explaining the need for fast and reliable communication networks such as 5G mobile systems to ensure that distribution and transmission networks are operating at maximum efficiency in the future. The ETIP SNET’s mission is to guide research, development and innovation (RD&I) activities to support Europe's energy transition. 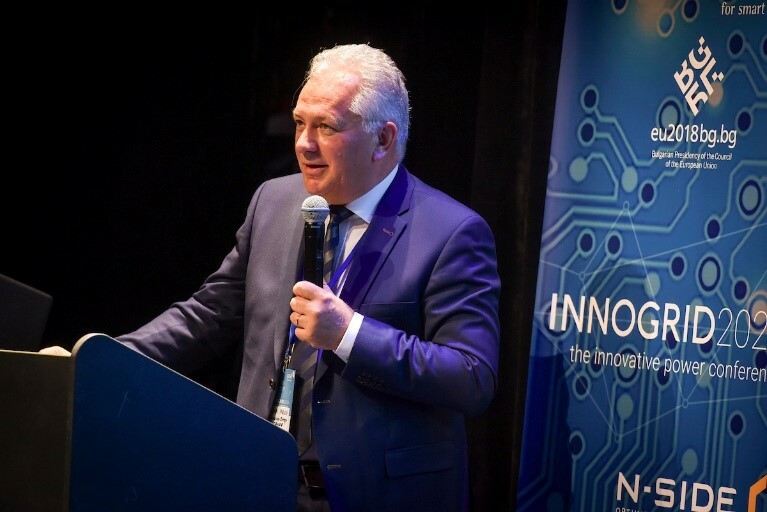 The ETIP SNET aims to set-out a vision for research and innovation for smart networks, storage and integrated energy systems and engage stakeholders in this vision. It identifies barriers and solutions to promote innovation, notably related to regulation and funding. The ETIP SNET aims at elaborating a vision and a Roadmap for R&I activities for smart networks, storage and other sources of flexibility, and integrated energy systems, engaging all stakeholders. It also looks at customer participation and the impact of digitisation. A National Stakeholders Coordination Group to liaise with various national actors.